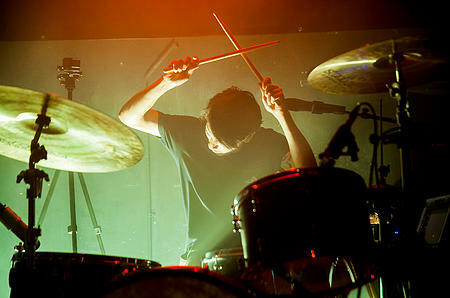 Martin James Kong picked up his first pair of sticks in 2004, starting his band Caracal as a hobby. Years later, Caracal has performed in Canada, Japan, China and Southeast Asia, and has opened for acts like Anberlin, Funeral For a Friend, Underoath and The Used, and released their ‘Bear. Shark. Wolf.’ LP and ‘Phoenix’ EP, both well-received in Asia and beyond. Caracal’s latest LP ‘Welcome The Ironists’ hit #1 on iTunes Singapore upon its release in December 2014. Beyond being the leader and drummer of Caracal, Martin has sessioned and filled in for acts such as Inch Chua, Monster Cat and West Grand Boulevard. His passion and dedication have not gone unnoticed- Martin is currently endorsed by Wincent Drumsticks. ​Martin uses : Wincent 5B Hickory Drumsticks.